IMPORTANT NOTICE! We have MOVED! 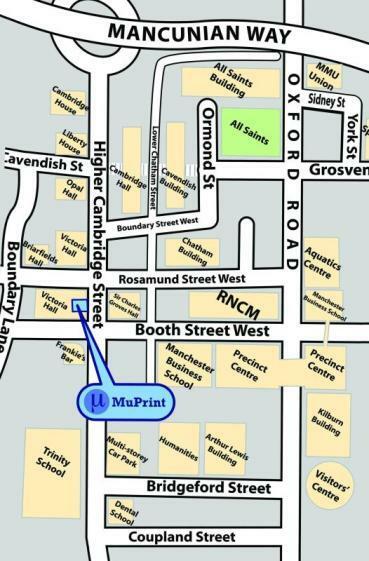 U-Print is now operating all its services from the main MuPrint shop on Higher Cambridge Street. You might not have visited us before but we’re really easy to find. We’re at Victoria Hall on Higher Cambridge Street, just across the road from the new MMU Students’ Union building, and we’re very close to the Royal Northern College of Music (RNCM) and Manchester Business School (MBS). If you are at the University of Manchester on Oxford Road, we’re less than 3 minutes walk away from the Precinct Shopping Centre. Simply walk down Booth Street West, past the RNCM’s main entrance and we’re near the junction of Higher Cambridge Street and Booth Street West, next door to Italian Express. MuPrint is open Monday to Friday, 9am to 5pm during University of Manchester attendance periods. During university vacations, our opening times may be subject to change. We are closed on all Bank Holidays, for an extended period during the University Summer holiday period and over Christmas & New Year. On occasion, especially during busy periods, it may not be possible to do your work straightaway. We will still endeavour to complete your order in the fastest possible time but please keep this in mind to minimise disappointment. Making a PDF can save a lot of the hassle that people often get when they try to print certain types of files, e.g. Word documents. More information can be found on the Make a PDF page. U-print.com is your one stop print shop based in Manchester Students' Union on Oxford Road at the University of Manchester. Our main services are printing and copying in full colour and black & white. We also offer soft and hardback binding with gold lettering, Business Cards, Booklet making, T-shirts, scanning and laminating. We always strive to produce customers' work on a while-you-wait basis or as soon as possible. Our services are available to everyone too!! U-print.com is the original Manchester student print shop. Our dedicated and friendly staff aim to make certain that you will get a quick and professional service. Furthermore, as U-print.com is based in Manchester Students' Union, the rent we pay is returned to the Students' Union for the benefit of Manchester students.